This post was written by Nicole Hitner, a content strategist at Exago, Inc., producers of embedded business intelligence for software companies. She manages the company’s content marketing, writes for their blog, and assists the product design team in continuing to enhance Exago BI. A relational database is ultimately just a collection of data tables, each of which is useful on its own, but exponentially more useful when joined to its neighbors. Data scientists-to-be will have a leg up on the competition if they go into their first SQL course with a basic understanding of the four essential join types, which not only merge data on output but also filter it to display a specific subset of records. 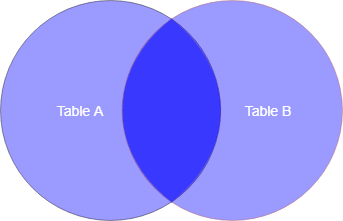 Before we explore how joins define the relationships between tables, however, we first need to understand what a key field is. We will discuss two types of key fields: primary keys and foreign keys. A primary key is a field or column that uniquely identifies each row or record in the table. 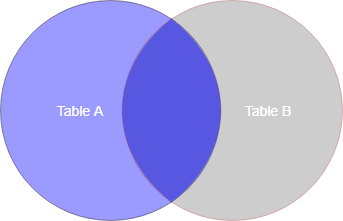 A table must have exactly one primary key to qualify as relational, but that key can be composed of multiple columns. In the set of tables below, for example, kid_id is the primary key for KIDS and chore_id is a foreign key corresponding to a field of the same name in CHORES. Note that CHORES does not have a foreign key for KIDS. You might wonder why kid_name isn’t the primary key for the KIDS table. Its values are indeed unique per record, but what happens if we begin adding records to the table? As soon as a new, different Steve is added to the KIDS table, kid_name stops being unique per record. This is why it’s a good idea for the primary key to have only one job: locating records. Because KIDS has a foreign key corresponding to a primary key in CHORES (chore_id), we know that we can join these two tables together to make one. How that happens, however, will depend on the join type. The most basic database join is what’s known as a full outer join. The output contains all the primary ids in both tables and all fields in both tables, regardless of whether the records have matches in the opposite table. If, in the diagram below, we represent data that will appear in the output using the color blue, we can see that all records from both tables will be returned. Let’s look at a new example. 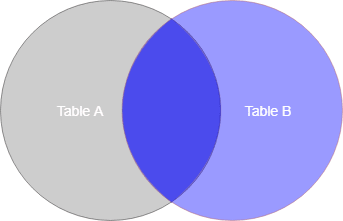 Consider the following tables found in a university database. 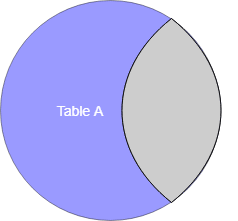 Left outer joins use all the primary ids of the left table and all fields of both tables. 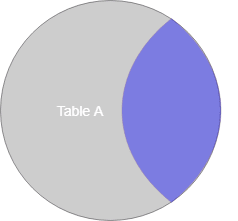 In the diagram below, we see that all records of the left table appear in the output, along with those in the right table, as long as they have matches in the left. Note that HUM311 is nowhere to be found on this table. That is because it neither has a primary key in the left table (because it’s a room, not a course) nor is it associated with a course. We’re beginning to see how joins can act as filters by restricting which records return from the query. The fourth and final basic join type is an inner join. Here, the only records we want to be returned on output are those referenced in both tables. An anti join is the opposite of a semi join; we only return records from Table A that do not have matches in Table B. Once you’ve got these basic join types down pat, you can explore formulaic joins, such as those containing conditional statements, ranges, and calculations! SQL is such a versatile language that joining options are virtually endless. Understanding these four primary concepts will help prepare you for other lessons in databases, data science, and analytics.